Jesmond Dene, a steep-sided wooded valley and park less than a mile from the centre of Newcastle, has a leafy, winding road running on the edge of its western side. Because, in parts, it hangs over the edge of the park Newcastle City Council feared it could be sued should a motorist overshoot and end up falling into the valley. To prevent this happening the council released plans earlier this year to “protect” motorists with a motorway-style barrier. Jesmond Dene Road would be made one way. Earlier plans for allowing cyclists to ride both ways on this beautiful road close to my home were dropped. 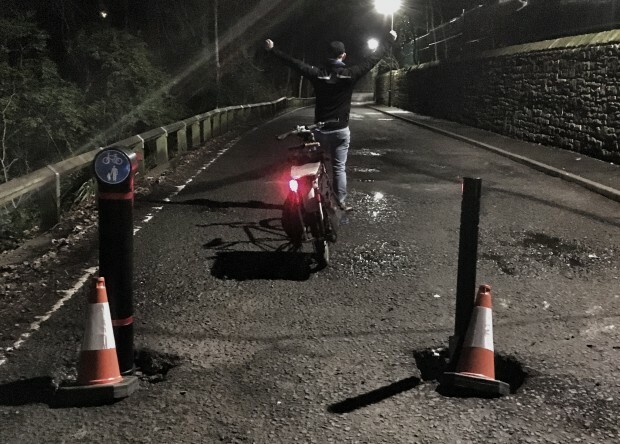 I, with others, feared the addition of ARMCO barriers and the lack of two-way traffic would send out the message that Jesmond Dene Road was to be treated as even more of a motorists’ race track than it had been for some years. I used Photoshop to create an image that showed what Jesmond Dene Road would look like should it become “armoured”. 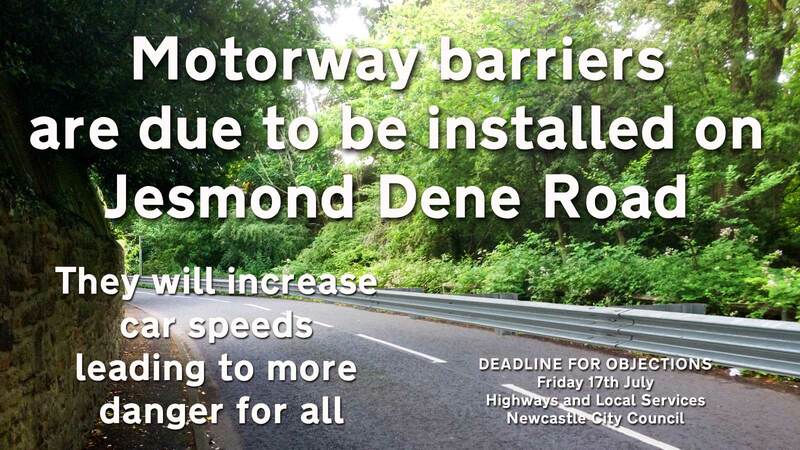 I sent a press release from the Friends of Jesmond Dene warning that installing a motorway barrier would make Jesmond Dene Road into “Newcastle’s Nürburgring”, a reference to the public road in Germany that is also a genuine race-track. This press release made it into the local newspaper. Along with Sally Watson of Newcycling and a number of other people, including a biographer of Lord Armstrong (who had gifted the Dene, his “garden”, to the people of Newcastle in 1883), an email- and letter-writing campaign was wheeled out aiming to impress on Newcastle City Council that making Jesmond Dene Road into a racetrack for motorists, and neglecting the needs of cyclists and pedestrians, was very much not welcome. UPDATE (16th March 2016): Some time earlier today works were carried out to prevent motorists accessing Jesmond Dene Road. I didn’t know the works were taking place, I just discovered the “filtered permeability” posts when I went out to pick up my daughter this evening. It was wonderful to ride along the road knowing there would be no cars coming along the other way. This made me very happy. Roads are for people, not just for people in motor cars. A chapter in Roads Were Not Built For Cars explores this topic in depth. The full text of the chapter – WHO OWNS ROADS? – can be found on this clicky-flicky embed. I’ve also included some of the chapter below. It’s sub-titled: “Roads belong to all and need to be shared by all. However, there’s a long history of some road users believing they have priority over others.” The book is available in a number of formats and in plenty of retail outlets. Belief in road “ownership” – even if it’s just the few metres in front and behind the road user – leads to disagreements, but probably what many motorists and cyclists would agree on is that roads are thoroughfares for travel. The right to use the public highway applied to all highways, which today translates into the freedom for British motorists to drive their motor vehicles on almost all roads, not just the ones designed for their exclusive use, the motorways. In Germany (and the Netherlands) it’s far easier for planners to separate different road users because there is a greater appreciation that these users will have different needs, concerns and desires. Dutch planners can and do designate some roads as more important for motor-vehicle use and others as more important for cyclists, or for the exclusive use of pedestrians. Dutch motorists are prevented, or mightily discouraged with design, from using those roads that have been designated as important routes for other users. In Britain, the ancient and much-cherished freedom of *people* to use roads – any and all roads – has led to a system where motorists “rat run” on minor roads despite adjacent arterial roads. While some British motorists argue that cyclists ought to stick to cycle paths (of which there are but few), they would find it perverse to be restricted only to motorways and arterials. The British affection for queuing has resulted in a strongly held belief in first-come first-served but different rules apply on the roads – the British system of affording road users the “freedom” to travel howsoever they choose results in the heaviest, fastest and widest users creating their own priority. The lawful movement on the British highway was, in the main, not movement on wheels. People walked, or rode on horseback, or took to waterways. No man should be pestered by giving the way … to hundreds of pack-horses, panniers, whifflers, coaches, waggons, wains, carts, or whatsoever others, which continually are very grievous to weary and loaden travellers; but more especially near the city and upon a market day, when, a man having travelled a long and tedious journey … shall sometimes be compelled to cross out of his way twenty times in one mile’s riding, by the irregularity and peevish crossness of such-like whifflers and market women; yea, although their panniers be clearly empty, they will stoutly contend for the way with weary travellers, be they never so many, or almost of what quality soever. I have often known many travellers, and myself very often, to have been necessitated to stand stock still behind a standing cart or waggon, on most beastly and unsufferable deep wet wayes, to the great endangering of our horses, and neglect of important business: nor durst we adventure to stirr (for most imminent danger of those deep rutts, and unreasonable ridges) till it has pleased Mister Garter to jog on, which we have taken very kindly. British cyclists and motorists have the same “easement-like” rights as pedestrians and equestrians – the right to “pass and repass” over public highways, such as roads. This is the right of “passage”. There’s also a right of “carriage” – in other words the right to carry something while travelling. Up until late in the 19th century the word “carriage” meant the act of carrying and had nothing to do with a wheeled vehicle. In other words, landowners own the soil below the “right of way” – in fact, quite a way below: ownership is down to the centre of the earth – but not a lot can stop folks exercising their king-given rights to passage over that soil. Roads were not built for cars. Nor were they built for bicycles. They were not built for sulkies, or steam engines, or any form of wheeled vehicle. Roads were not built for horses, either. Roads were built for pedestrians. H. G. Wells pointed this out, from an urban perspective, in 1901: “The streets of all the mediæval towns, were not intended for any sort of wheeled traffic at all – [they] were designed primarily … for pedestrians.” (Most medieval historians would dispute this, stating that towns and cities relied on the goods transported hither and thither by small carts). Wells highlighted the previous importance of pedestrians in order to make the point he felt they would not hold sway for much longer. A former leisure cyclist and, by 1901, an enthusiastic motorist, Wells predicted a future where the motor car would hold sway. As usual, he was ahead of his time. In 1901, the debate about the future of the street, of the road, had hardly begun. And by the time the debate was in full swing, motorists had already annexed – by speed and power – the great majority of roads, and some motorists were clamouring for “motor only” roads, too, either by imposing restrictions on who should now be allowed to use Britain’s “ordinary” roads, or promoting new-builds. Some years before this there had been parliamentary discussions about restricting the use of motor cars on the roads of Britain but, even before the majority of MPs were motorised, such restrictions would have been unthinkable because it would have encroached on historically resonant highway rights. When, in 1927, there was talk of restrictions being placed on the free movement of motor cars in English cities, arch-motorist Lord Montagu of Beaulieu played the liberty card: “If I am right in my opinion that the right to use the road, that wonderful emblem of liberty, is deeply ingrained in our history and character, such action will meet with the most stubborn opposition,” he warned. One man’s freedom can be another’s oppression. Who has the right to be on the road and with what purpose and with what accompaniments? Defining rights is usually done when there’s either a threat to deny their existence, or when they come into conflict with other rights. The right of the motorist to speed conflicts with the pedestrian’s right to free passage along the road without threat of death. Obstruction of free movement on the highway, say by speed limits imposed on motorists, may be seen by some as a loss of liberty but such restrictions lead to freedom for other users of the highway. Today, highway freedoms are not shared out equally. Society has allowed those with motors to gain more benefits from the road than those without motors. The “right of way” – the right to pass and repass along a public highway – tends to trump all other “rights,” especially when the player exercising the right of way is faster, stronger and, due to the principle of “if you can’t beat ‘em, join ‘em,” present in greater numbers. The historic and long-standing rights of pedestrians, cyclists and others to use the Queen’s highway no longer exist in reality, and the rights were made null and void from the early days of motoring. While cyclists from the 1870s onwards had excited some debate about what roads were for – and who they were for (children shouldn’t be allowed to play on roads, said some cyclists, anticipating the same views from motorists twenty years later, and pedestrians ought not to “dance all over the road”) – the steady encroachment of the motor car in the early 1900s, becoming faster and more powerful month by month, led to a fundamental reappraisal of hundreds of years of highway “rights.” Motorists were in a similar position as the rich land-grabbers 200 years ago, during the long period of the English “enclosures,” when land in common use by the many, was fenced in and appropriated by the few. Access to these common lands had been restricted by the new land “owners,” and, by dint of their speed, motorists were now restricting all other road users. In effect, motorists “privatised” the road network, for the benefit of their own kind alone. Was this to be allowed to continue? What were roads for? Can a road truly be a “public highway” when only those members of the public in motor cars had comfortable access to that highway? Who *really* owned the roads? Ownership was complex. So, too, was expected use. Roads were not merely conduits for travel – all life was lived on the roads, on the streets (the definitions of these two terms were left legally vague). The road was deemed to be public space, not private property. Children played on the road, vendors sold from the road, people met and talked on the road. The road wasn’t a fixed space, hemmed in by kerbs. Roads were fluid; they were more than just highways for “passing and re-passing,” more than just about movement. American illustrator Joseph Pennell, famed for the European cycle tours he did with his high-society wife Elizabeth, revealed his inner road hog when, in 1902, he talked about how pedestrians now had to get out of the way of those propelled by motors (he gave up pedalling and became a motor cyclist). The fact must be brought home to [the] imbecile at once that he has got to keep to his part of the highway, that is to the side path. The British belief that a man has the right to camp out in the middle of the road, or use it as a reading-room, because his grandfather did, must be knocked from his head, even if by sudden concussion … These are his last years, let him make the most of them … The motor is going to become the means of locomotion … It is the pedestrian and the horse that have got to give way. In a long and detailed polemic in The Nineteenth Century magazine, barrister and early motorist Walter Bradford Woodgate argued in 1903 that British highways very much belonged to pedestrians. Motorists could use the highway by “privilege of statute” but not by “birthright,” he said. Woodgate was writing months before the introduction of driving licences, which demonstrated vividly that, in theory, such “privileges” could be removed. (This was why the motoring organisations – libertarian when it came to such things – were opposed to the introduction of driving licences, as well as compulsory insurance and speed limits). The pleasure [of motorists] appears to consist mainly in the exhilaration derived from velocity, and from rapid motion from one locality to another, paramount to any appreciation of scenery en route, or of any desire for hygiene in taking the air … The deduction from this observation is that any measure for licensing higher velocity will be in effect a statutable warranty for a moneyed minority to make public highways a playground for certain new toys, and a locality for pastime. Numerous MPs had similar concerns. Going back to the debate over the Motor Car Bill of 1903 featured in chapter 1, it’s illuminating to find so many MPs fretting that motorists, given free rein on British roads, would soon monopolise them, to the detriment of all other users. It is our birthright to have the common use of these roads, and, speaking as a countryman who lives in a district where the roads are narrow, I say without hesitation that we no longer have as our birthright the common use of these highways. We can no longer go out ourselves without danger; we are afraid to send out our children. “It will be a matter of the utmost importance to reserve for the motor-vehicle the road upon which it is to run, and to divert to other channels the animals and vehicles which may hamper it,” argued America’s *The Automobile* in 1900. Pedestrians were also to be diverted away from roads. “The provision of sidewalks for pedestrians has been one of the means of preventing a congestion of the traffic of large cities,” said the magazine. The main selling point of the car was speed, and if pedestrians (and trams and cyclists) remained on the road, cars would have to travel at the speed of the slowest user. Until the 1920s, the rights of all road users were defended by the mainstream press, the police and the judiciary. The private driver is … most strongly influenced by the sense of ownership of his car, and, as he often believes, of the road as well. It is “his” car to do with as he pleases, and, as he often believes, it is “his” road too, and the other road-users are merely intruders who are there at their own peril. He added, when else in history has humanity lived with the “foul, strange and unnatural” belief that it should be “common custom to kill and maim people because they get in your way”? The changing nature of road “ownership” has been preserved in a series of British maps. In 1898, Messrs Bartholomew of Edinburgh stole a march on its many competitors by partnering with the most powerful road interest of the day – the Cyclists’ Touring Club and its 60,500 members. Crowd sourcing from touring cyclists enabled Bartholomew to update its maps every couple of years. In the early 1900s, the descriptions for roads remained quaint – poorly surfaced roads were labelled as “indifferent” – but then in the 1920s there was a shift in emphasis. 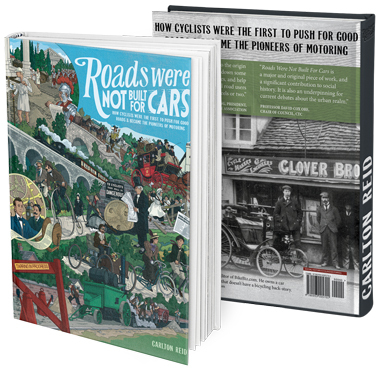 Major through routes – routes that had very often been brought back to life by cyclists – started to be listed as “motoring roads.” Nothing had changed on the ground, but everything had changed in the minds of motorists. Roads were now “owned” by motorists. Motoring was less than 25 years old, yet the perceived interloper on the ancient roads of Britain wasn’t the motor car, but the pedestrian, the equestrian and the cyclist. Today, in Britain, many roads are no-go areas for those without motors. Heavy, fast-moving motor traffic has been allowed to take over what are often *public* highways in name only. On A-roads and B-roads alike there’s usually precious little provision for anything other than cars and trucks. The public highway – once open to all – is now genuinely open only to those with motors. Pedestrians, equestrians and cyclists have retreated to footpaths, bridleways and (dire) cycle paths, yet these make for an indirect and incomplete network, suitable for (only some) recreation, of limited use for everyday travel. Requests to local authorities to make roads into highways usable by all, say by installing a parallel protected cycle path or a footpath, usually fall on deaf ears. The “liberty of the subject,” Britain’s supposed love of egalitarianism, worked for the early motorists when they wanted to maintain their “right of way” on the country’s ancient highways, but once roads became “motoring roads” there has been no desire from motor-besotted powers-that-be to make sure non-motorised road users regain “uninterrupted possession” of *their* “right of way” birthrights. Roads weren’t built for speeding cyclists either! Take cars out of the equations, and cyclists seem to think they have a right of way. They hurtle around, with no cars to hinder them, but pay no regard to pedestrians! I would like to see speed limits introduced for cyclists around Jesmond, particularly Armstrong Bridge…in fact I think cyclists should be prevented from riding their cycles where pedestrians are walking! They should be made to get off their bikes and push them through pedestrianised areas. I am sick of almost being hit by cycists hurtling around the streets of Jesmond with no regard! At least with cars you can hear them coming and they mostly slow down for speed humps. Most cyclists seem to enjoy the thrill of riding the speed humps and don’t slow down! Something should be done before someone is killed or seriously injured by a speeding cyclist! It can be annoying when some cyclists ride too fast beside pedestrians. Annoying but not, on the whole, life threatening. (Cyclists do kill pedestrians but it’s so incredibly rare that it becomes a news story – not so with deaths caused by motorists, which are many times greater … even deaths by motorists caused to pedestrians walking on pavements is huge.) Most people on bikes are well aware that if they hit a pedestrian it’s quite likely they could be injured too. Naturally, there are some ill-mannered people who don’t take this into account, but they are not in the majority. On Armstrong Bridge there is a raised footpath on one side but pedestrians rarely use it, preferring the full width of the bridge. This is usually fine because there’s plenty to room to pass, and most cyclists will be very aware of the movements of pedestrians ahead of them, for the reason stated above. At pinch points it becomes more of an issue but, by and large, pedestrians and cyclists are able to negotiate passage in such spaces because neither are protected with the sort of armour a motorist can use to enforce their supposed “right of way”. There are many studies – including video studies – that show that cyclists and pedestrians are actually good sharers of space. Many city centres – Leicester is an example – have pedestrianised cores where cyclists and pedestrians mix well. Both entrances to Armstrong Bridge involve downhills, which enables cyclists to build up speed. This is slightly mollified by bollards at both ends, but perhaps more could be done to impress on cyclists that this downhill access will lead to speeds that could cause distress to pedestrians? The greatest threat is when there are just a few pedestrians around – when the food market is on, and the bridge is packed with pedestrians, cyclists get off their bikes and wheel them. As a point of interest cyclists are not bound by any speed limits, not even on roads. Speed limits are for motorised vehicles only, for the obvious reason that it’s motorists which have the greater propensity to kill and maim. I’m a motorist and I slow down when I see pedestrians and cyclists approaching Armstrong Bridge, especially on the climb up Benton Bank where the view of the pedestrian and cycle access is blocked by parked cars. I don’t see many of my fellow motorists doing the same. I’d hazard a guess that the greatest threat to life and limb in the Armstrong Bridge area is a motorist hitting a cyclist or pedestrian at that point.